This was such a sweet idea that the girls to made for our Mother's Day tea party. It's also Daisy level approved for their little hands and they can complete this in under 10 minutes! Have the girls put their name on one of the yellow circles and turn facing down toward the table. Put some glue on top of the circle and lay the 2 white pieces of ribbon making a v shape starting from the middle of the circle and extending past the yellow paper. Add a dab of glue on top of the white ribbons and lay the yellow ribbons on top. Add another dab of glue and take the other yellow circle and place directly on top like you are sandwiching the ribbons between the 2 yellow circles. Set aside to dry. Take your brass brad and one of your cupcake liners. Punch the brad through the center of the liner with the liner coning the flat back. Do this with the rest of the cupcake liners. Open up your brass brad. Fold and crinkle the liners closed to look like a blooming flower. Start with the first liner and fold and crinkle one by one around the previous liner. It doesn't need to be perfect because each flower is unique. Glue the flat bottom of the cupcake liners onto the center of your yellow circle and allow to dry completely (couple hours). 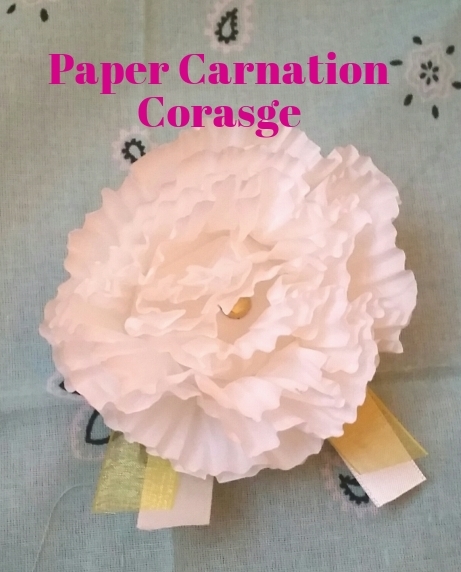 For a corsage: take a 12 inch strip of ribbon and glue at the middle of the ribbon to the bottom of the carnation so you can tie it around a wrist. 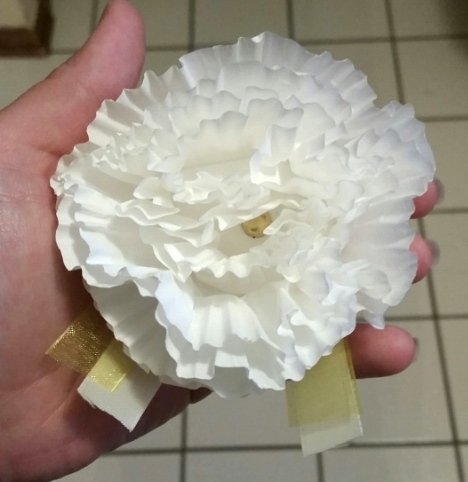 For a boutonniere: You can use a single pin or you can hot glue brooch pins to the back to create a pin. I thought this was such a cute idea and easy for any kid to do. It makes a great Mother's day gift too! Posted on May 30, 2016 by Katie D. and filed under Girl scouts, Celebrate and tagged leader other girl scout arts and crafts girl scout parties.